Sim Racing System Sim Racing System News New Raceroom Series starting January 28th! We are delighted to announce the new series for Raceroom, starting January 28th! 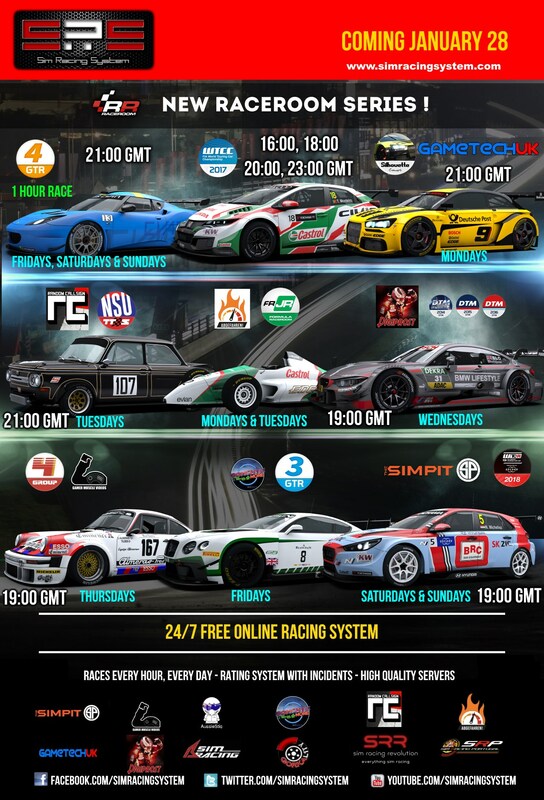 SRS will feature a GTR_4 series on fridays, saturdays and sundays at 21:00 GMT. This races will feature a 1hour race with mandatory pitstop. WTCC17 daily series running 10 min Qualify + 20 min races at 16:00, 18:00, 20:00 & 23:00 GMT. I`m looking forward to racing the NSU. Also Formula Junior is free so should be popular. But in the schedule of races, only two days Saturday and Sunday. Where is the error?